Posted on 11th June 2018 by Gavin in News, Nutrition. comment(s). For all too many of us, sugar is the ultimate weakness. Whether it’s a a bumper bag of chocolate or sweets in the evening, or a lingering hand in the biscuit tin, the sweet stuff is ever tempting – and that temptation can be sky-high with endless ice creams now lining supermarket aisles! Of course, we all know that sugar is bad for us. It can cause us to gain weight, especially around our tummies, cause blood sugar spikes, and lead to all sorts of other health problems. So why, when we know all of that, is it so hard to beat that sugar addiction? If you love sweet-tasting foods (and, really, don’t we all? ), then try reaching for a natural alternative – vanilla and nutmeg are both wonderful at adding a sweet flavour to foods, while a sprinkling of warming cinnamon can add sweetness, while helping to balance blood sugars. We know that one of the major keys to being healthier and happier is loading our plates with greens. Yet, did you know that they’re crucial in our fight against sugar addiction, too? Sometimes, a sugar craving can signal a magnesium deficiency within our body. Magnesium-rich foods include leafy greens, and even brown rice like in our pasta! Some doctors believe that an L-Glutamine (an amino acid) supplement may help us to fight off those sugar cravings. Meanwhile, B-vitamins can help to energise the body, so we’re less tempted by the cookie jar. 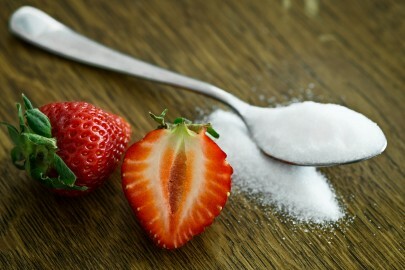 Stress can often cause strong cravings, particularly for sugary foods. If you’re feeling frazzled, then why not try to meditate to balance out your head space? If you’re still craving sugar, then be kind to yourself! Addictions can take time to overcome, so don’t beat yourself up over it. When those sweet-toothed cravings strike, enjoy a piece of your favourite fruit (tip: try to eat it with the fibre-rich skin to prevent blood sugar spikes) or a handful of berries, or perhaps enjoy a serving of full-fat Greek yoghurt with a sprinkling of nuts and a small drizzle of raw honey.